I take after my mom. I inherited her bad eyes and grin. 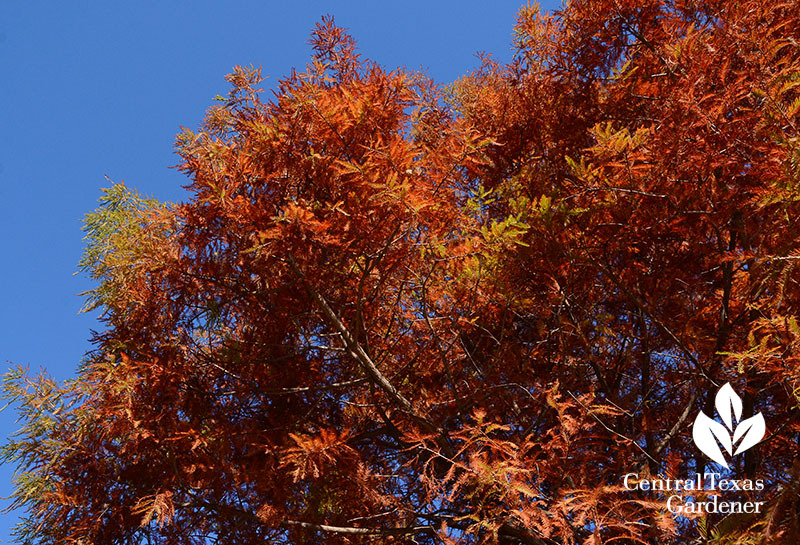 And though she’s been gone a few years now, I still hear her say, “Fall’s my favorite season.” Mine, too. 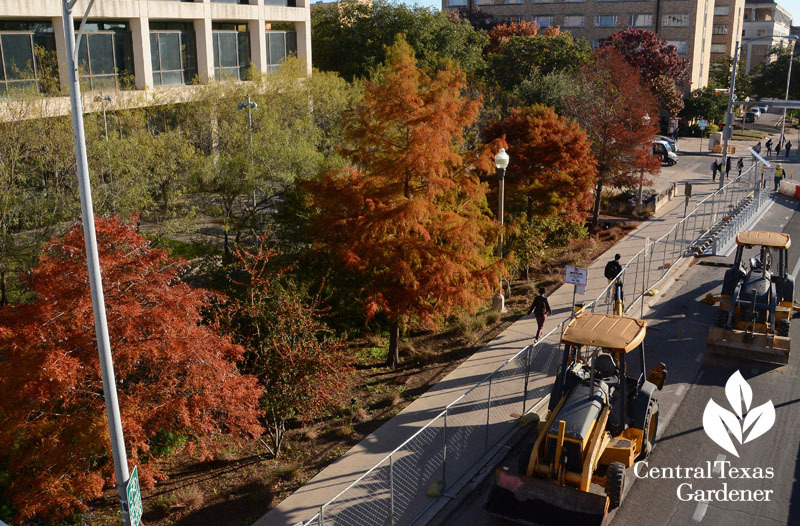 Along the BELO Center for New Media across from KLRU, bald cypresses, red oaks, possumhaw and yaupon hollies entice us all away from computer screens for a moment to admire landscape architect Christy Ten Eyck’s dazzling design. 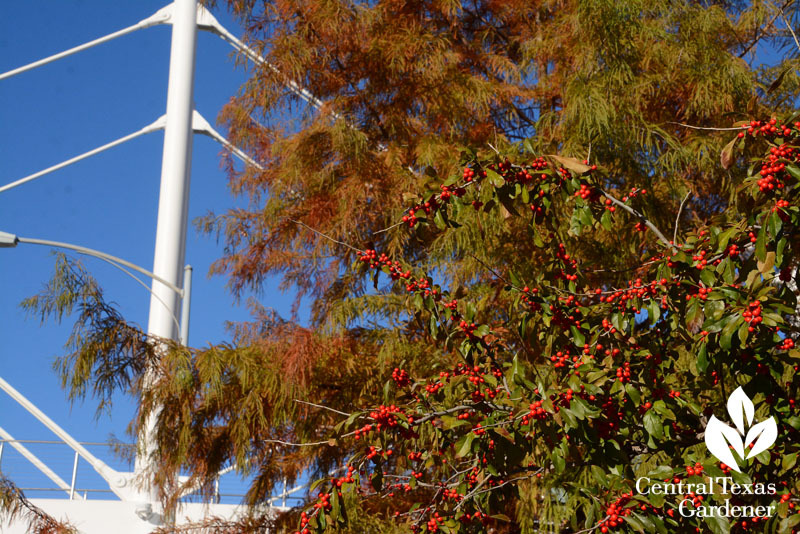 Bald cypress provides its own ornaments—female seed cones. 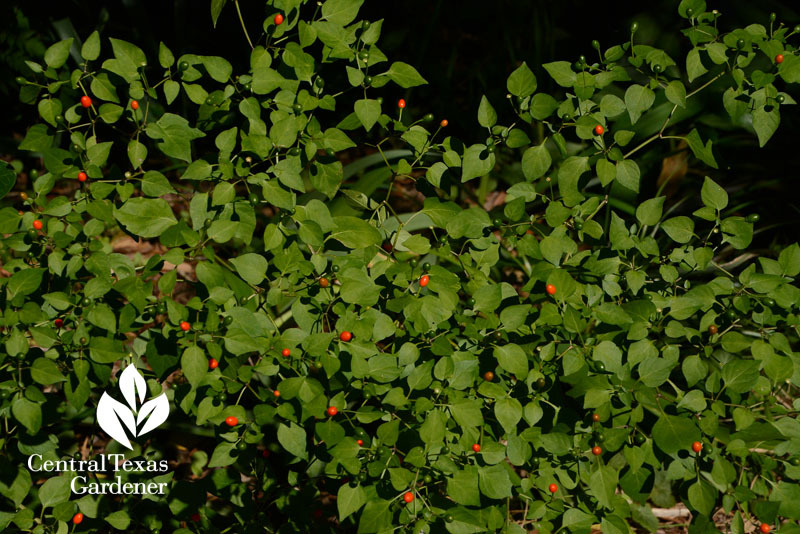 Possumhaw holly’s got “holly berries” covered until birds make it through traffic jams for the plump, red fruits. 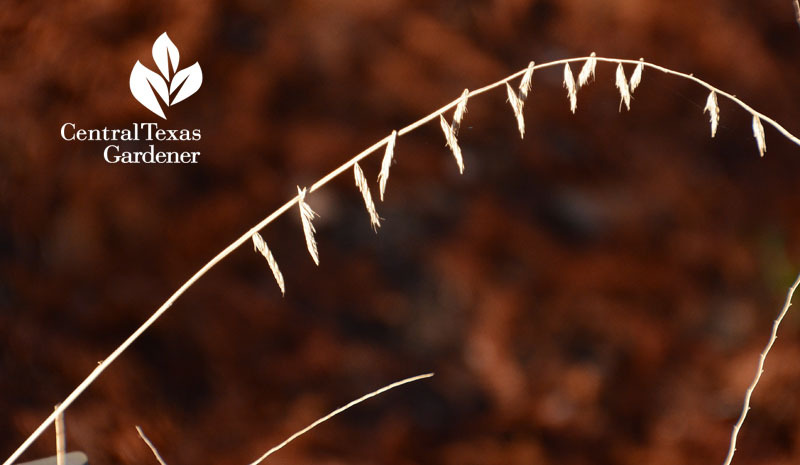 Texas State grass, native sideoats grama, gracefully curls over fallen bald cypress leaves. Across town, red oaks slow traffic on the median that Colleen Jamison planted across from her house (her garden with Bruce Baldwin coming your way February 2). 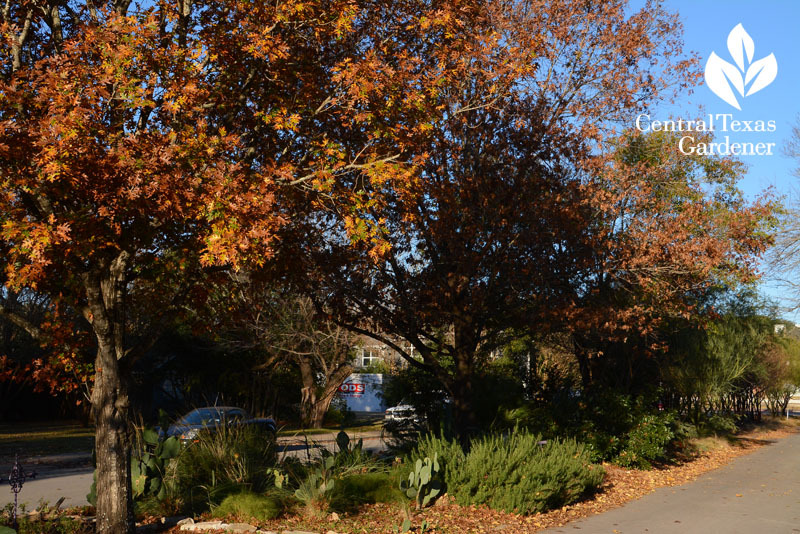 For the scoop on Austin’s sensational leaf-peeping this fall, check out KUT’s Mose Buchele story with certified arborist April Rose, City of Austin Urban Forest Health Coordinator. 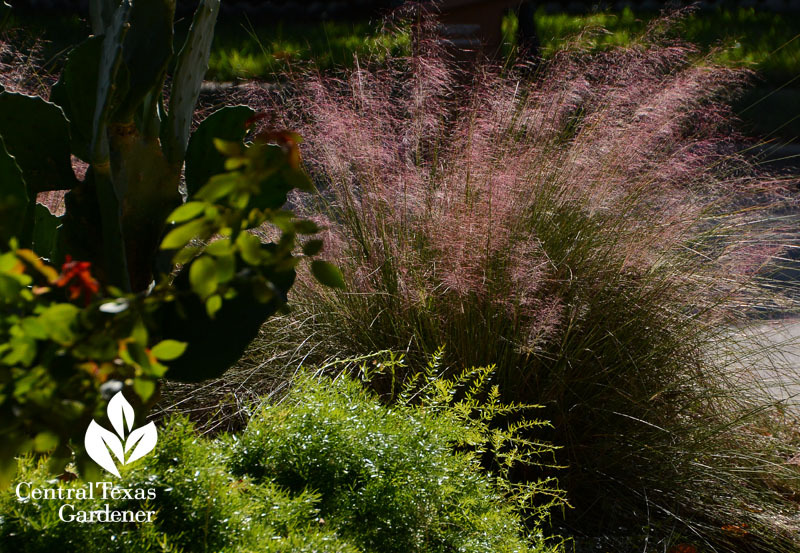 Clumping grasses are worth a peep, too, like frothy Gulf muhly at the home of garden designer B Jane. 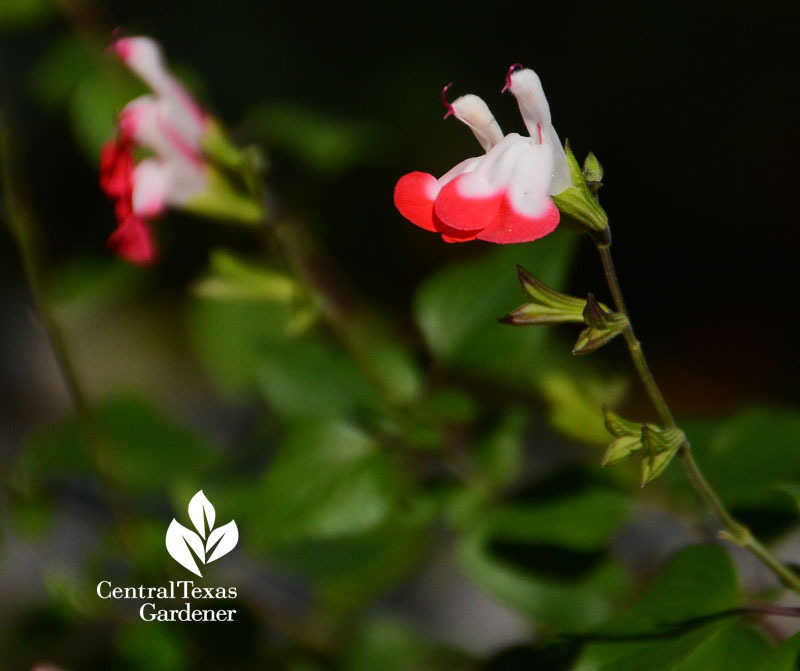 My ‘Hot Lips’ Salvia microphylla offers lip-smacking good nectar to all the butterflies and bees taking advantage of the warm days between cold breaks. 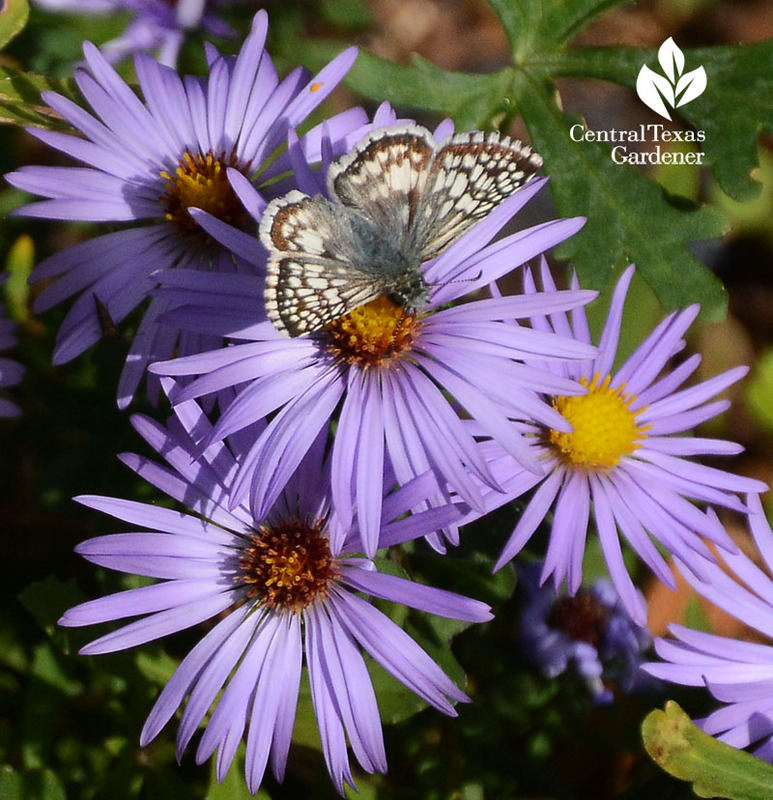 On a sunny day, flying insects cover the still-going asters, including this white-checkered skipper. 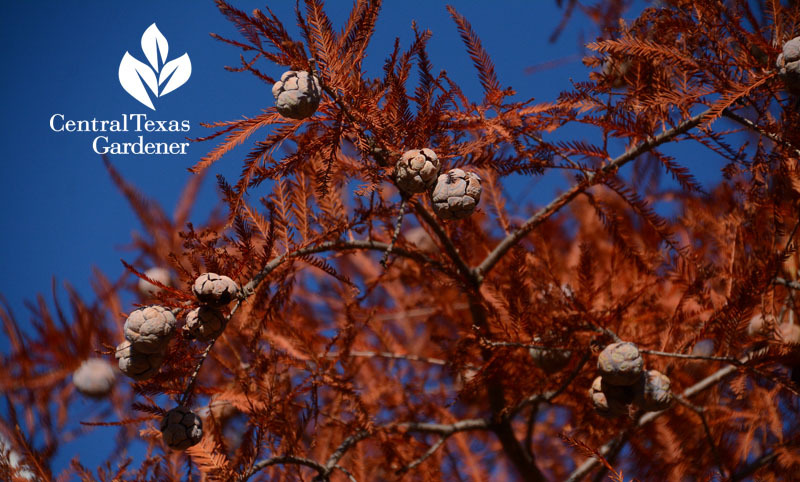 Our early freeze event—record low of 24° on November 15—browned some plants across Austin. 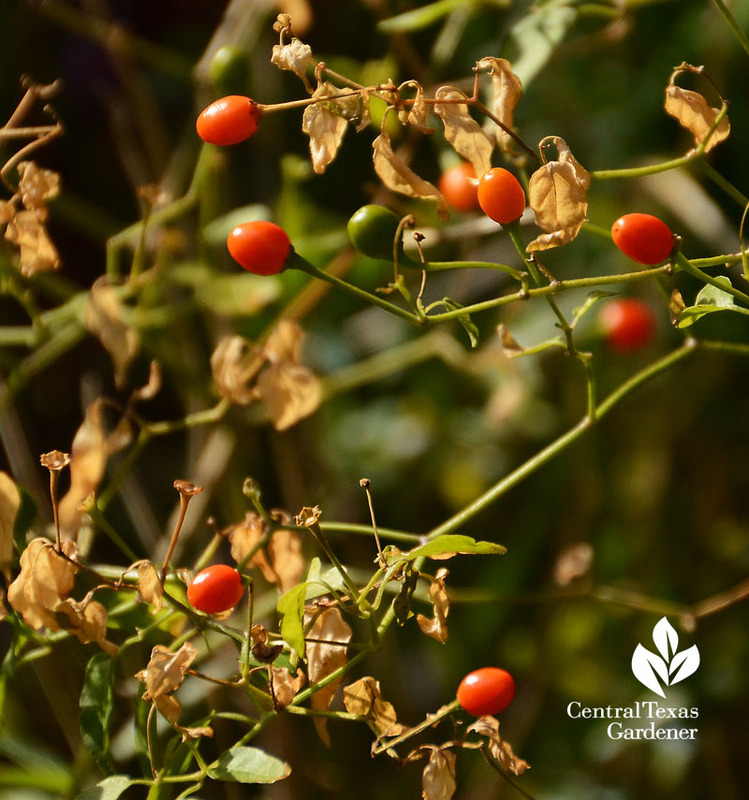 In my own garden, this self-seeded chile pequin was unfazed. Just 10 feet away, another got nipped. That’s microclimates for you! On January 5, we’ve got pruning details for you. For now, shelve your clippers. If we prune now, deceptively warm days can prompt new growth when winter has just begun. Instead, let’s plan ahead for planting season! 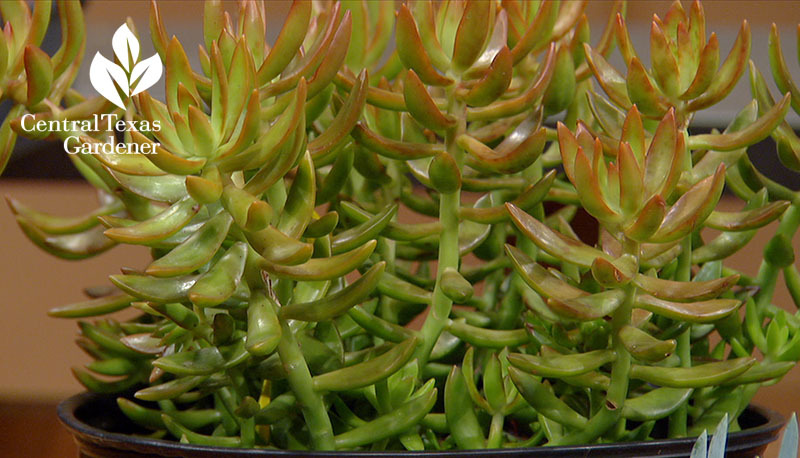 Coppertone sedum’s got those warm tones we love in full sun or part shade, but it’s only hardy to 25-30°. Great for containers that you can protect! 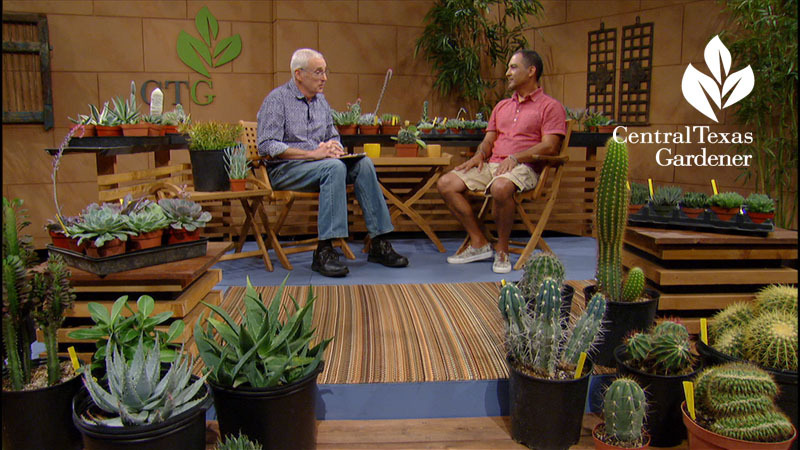 Watch our segment with Jay Arredondo of Desert to Tropics Nursery for super succulent ideas, including ground hardy beauties. 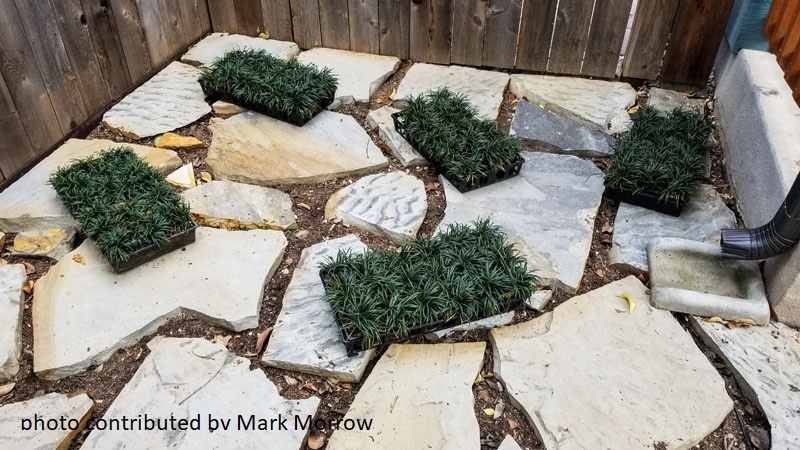 Plan your DIY lawn-to-patio makeover with Mark Morrow. 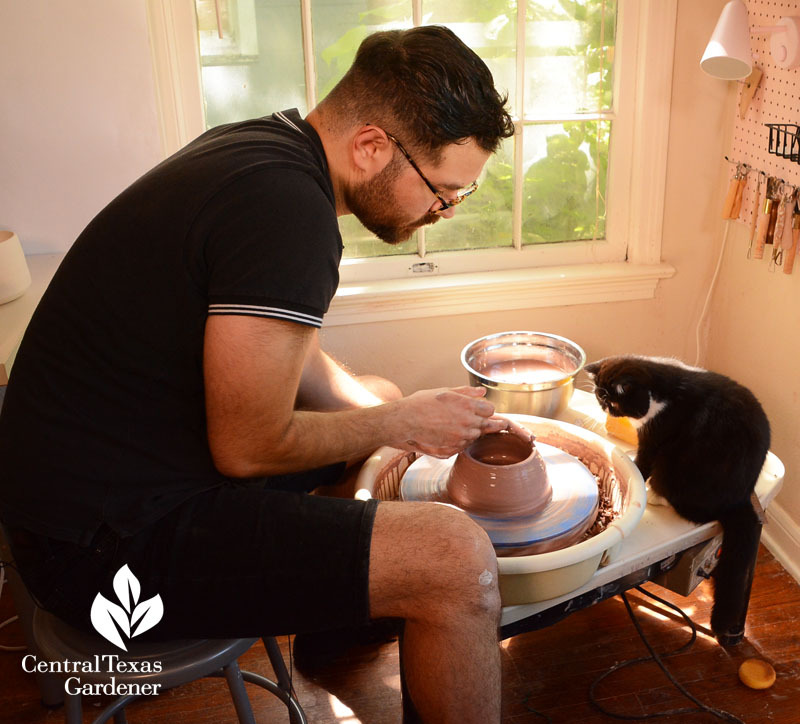 And, inspire new goals (whatever they may be) with our visit to graphics designer James Barela, who found another creative outlet and launched a new business.